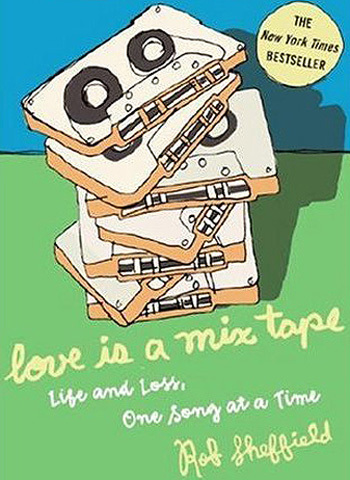 "Mix tapes: Stick one into a deck and you’re transported to another time in your life. For Rob Sheffield, author of Turn Around Bright Eyes, that time was one of miraculous love and unbearable grief. A time that spanned seven years, it started when he met the girl of his dreams, and ended when he watched her die in his arms. Using the listings of fifteen of his favourite mix tapes, Rob shows that the power of music to build a bridge between people is stronger than death." Writers from Nick Hornby to Jonathan Coe have reminisced on the music of days gone by, invoking images of vintage records, past romances, and even political landscapes. Rob Sheffield has now joined the ranks of these British authors by producing an American rival in the form of Love is a Mix Tape, published in 2007. By capitalising on the 80s and 90s nostalgia of a mix tape, this iconography is set to draw in a whole new generation of music lovers’ ruminations on the tracks they treasure(d). Such books are arguably better suited to life as audiobooks due to their hybrid nature. By giving each chapter the title of a mix tape that he has made, Sheffield makes the reader want, while they read, to be able to hear the music that each chapter is set to. However, the book’s interdisciplinary nature is even more layered than this, making its genre even more difficult to categorise: it crosses the borders of fiction, non-fiction, autobiography and popular history, to name but a few. This makes its appeal very broad, and this is further emphasised by the accessible style in which it is written. Accessibility, though, should not be read as debased. Despite the narrator’s matter-of-fact personality, he can also be heartbreakingly poignant in what is also one of the greatest love stories (or should that be songs?) ever told, effectively making the book a paean to his first love, Renée, without putting her up onto too much of a pedestal. The reason for this becomes apparent as we read, adding further to the narrative's pathos. Nonetheless, this does not result in depressing the reader: by the end of Love Is A Mix Tape, we not only want to go out and discover the unknown tracks recommended to us by the author, but we also feel even more grateful for our lives, giving us the urge to pass on Sheffield's story to others, in a way that even Nick Hornby is perhaps unable to do.